The Tenant's Check List For Its Headquarters Lease, and the Lease Clause Critique: The Pro-Tenant Corporate Headquarters Clause: Building Identity and Communication Facilities. This LARG looks at issues associated with a tenant's negotiation of its headquarters lease. The first article is a checklist for such a tenant that raises a number of items the tenant should consider when it is doing the deal. The Lease Clause Critique analyzes a clause from a lease for a tenant's corporate headquarters providing for exterior signage, building name and special communications gear for the tenant. When a large company negotiates the lease for its corporate headquarters, it makes for an interesting exercise. Often, the company will take all or substantially all of the space in the particular building. If the deal is a build-to-suit arrangement, in many cases, the tenant will build more space than it needs and seek to sublease the extra space for a period of years until it can "grow into" such space. If the building is already built, the tenant will frequently negotiate options to expand into space occupied by third party tenants. Any time a tenant takes the majority of space in a particular building, its leverage in negotiating the business and legal terms for the deal will be substantial. Obviously, the tenant will negotiate the best economics it can, e.g., the lowest minimum rent, the best operating cost reimbursement arrangement, additional options to renew at favorable rents, etc. 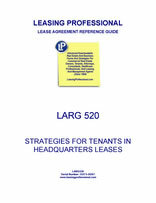 In that sense, a headquarters lease deal is no different from any other deal that the tenant negotiates as a large user. However, the tenant negotiating for a headquarters location will probably want special clauses relating to corporate identity and signage for the building, building name, special facilities and landlord services documented in the lease. See the Lease Clause Critique in this LARG for a clause that covers special tenant rights for building identity, exterior signage, and special communications gear. A tenant negotiating for a headquarters location will generally want prominent exterior signage on the building indicating that it is the tenant's headquarters. Unless the tenant is secretive (e.g., an organization akin to the Central Intelligence Agency) or extremely concerned with corporate security, corporate signage will almost always be prominent on the face of the building. In some instances, the focus on corporate security takes priority over corporate identity; for example, during the 1970's after several bombings, bomb threats and public demonstrations aimed at the firms, many large oil companies removed corporate identification from the facades of their buildings. In several cases, the signage was never put back on the exteriors of the buildings. What sort of signage would be appropriate for the building, e.g., is large illuminated signage located on the top, front or sides of the building necessary for corporate identification from nearby freeways? Does the tenant want or need the exclusive right to erect and maintain signage on the top, front or sides of the building? If other tenants are permitted to have signage on the building that are not affiliated with the tenant's headquarters, does the tenant have the right to approve those signs? What is the extent of the landlord's architectural control over the tenant's signs? Must the landlord be reasonable in withholding its approval of the tenant's proposed signage? Is the tenant's signage program subject to written signage criteria published by the landlord or its architect? Is the tenant's corporate name and logo preapproved (in the tenant's corporate color) in certain sizes for exterior building use? What sort of permits are required prior to the installation of such signage? Who is obligated to furnish exterior signage-- the landlord or the tenant? If it is the landlord, is the cost of exterior signage figured into the monthly rental, or otherwise treated in the Work Letter or elsewhere in the lease? Is the tenant permitted to have first floor name identification on the glass adjacent to the tenant's entrance? Is the tenant entitled to a monument sign or directional signage located some distance from the building? What rights does the tenant have for signage for its affiliates? Is language concerning approved signage of the tenant's affiliates limited exclusively to the tenant's main name and logo? If that is the case, what about companies with their own tradename and logo acquired by the tenant through merger or acquisition? What degree of control does the tenant exercise over the directory board located in the lobby of the tenant's headquarters?